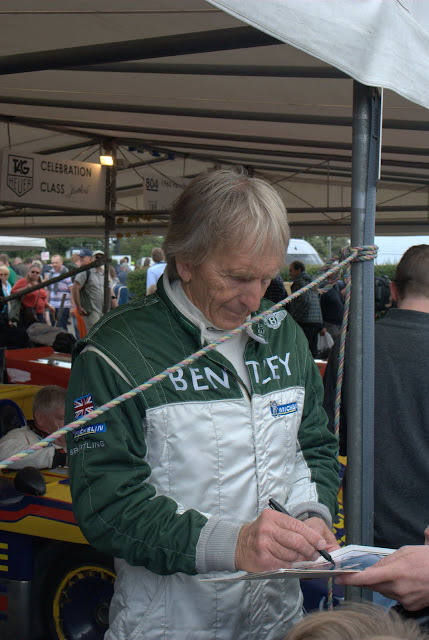 I spent two days at this year’s Festival of Speed and it was fantastic, this was my 5th visit but the first time I’d attended two days of the meeting (Friday and Saturday). The extra driving, the red arms and face, and the still-aching feet from two days of almost non-stop walking, they were all very much worth it. It is strange how perceptions change over time. I was always more into the cars and even at Goodwood always thought the drivers were far-off and hidden away. Not this year. I don’t know if it is because the drivers now emerge in the paddock from a new entrance, or if it was because I’ve seen some of the cars a few times now, or if it was because I was with people who have always been more driver-focussed. This year the personalities seemed a lot more interesting to me. It was of course excellent to hear Formula 1 engines once more, both modern and historic. McLaren, Ferrari, Red Bull, Renault, Lotus, Mercedes brought recent machinery to the event and ran them on the hill, whilst Williams had a static car. 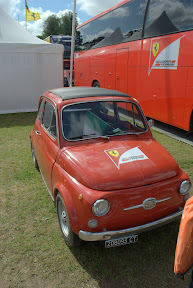 There were also classic cars from Ferrari, McLaren, Williams, Lotus and many more. It was Vitaly Petrov’s first time at the Festival and he seemed to really get into the spirit of it, doing burnouts on the hill and being friendly with fans as he walked through the paddock. 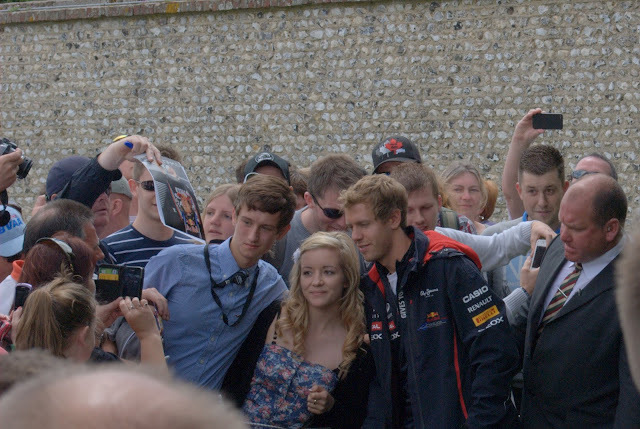 Mark Webber was doing a good job too on Friday, happily posing for photos and signing away. I also love seeing the big smiles writ large across the faces of the legends of the sport. 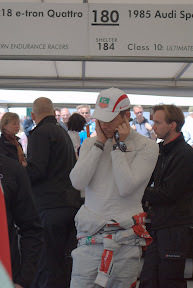 I was pleased to see the Audi R18 sweeping silently by, driven by 2011 Le Mans winner Andre Lotterer. There was also an R15 making runs on the hill with Marco Werner at the wheel. Peugeot sent their 905 but not a 908 in the paddocks, though there was a hybrid in the manufacturer strutures in the ‘infield’. Several classic sportscars were also present including Alfa Romeos – with Arturo Merzario – Jaguars, even a couple of Chaparrals. There was also representation from WRC, IRC, BTCC and a variety of motorcycles. Ken Block was fantastic on the hill! Kris Meeke and Guy Wilks put on a show with sideways action, Block took it even further with lurid slides and donuts! A big attraction for me this year was the celebration of the 100th anniversary of the Indy 500. I’m as much a fan of Indy racing as I am of F1, so to see so many drivers and cars make the effort to come over was very special. What people don’t appreciate is that most of these people don’t ever make public appearances in the UK, even the British drivers, and only a handful of cars only usually make the trip. Johnny Rutherford being the notable exception, he’s been attending Festivals since 1999. I believe this was the first time a contemporary IndyCar of any flavour (CART, IRL, current) has run at the Festival since it began – and maybe even the first in the country since the CART/ChampCar visits of 2001-2003 – so for me this was very exciting. But not half as exciting as seeing actual current IZOD IndyCar Series drivers come over here to drive them! Goodwood regular Johnny Rutherford was joined by fellow legends Bobby Unser, Al Unser Jr, Parnelli Jones, Dan Sullivan, Bobby Rahal, Kenny Brack and Gil de Ferran, as well as current drivers Dario Franchitti, Scott Dixon, Helio Castroneves and Dan Wheldon – no current drivers are usually present as Goodwood frequently falls on a race weekend, but not this year (with due apologies to Watkins Glen). F1 and Indy legend Emerson Fittipaldi was present in his Indycar capacity to drive a Penske. Dario Franchitti was a legend with the fans, as he is famous for being. My friend Kai isa big fan and after missing him Friday, made a vow to track him down on Saturday. We made a plan to watch the IndyCars return to the main paddock (though we didn’t think he was driving one), and right on cue a Lotus pulled up.. we tried to identify the driver.. and it was Dario! He’d stalled it waiting for marshals to signal him to move on, then got out and pushed the car. Here is the moment Kai runs off to chase him (she’s the one saying “I’m going”). Not only that but when asked for a photo he said ‘one minute’ and turned away to consult his aide, who was trying to tell him where he had to be next. He went and had a photo with someone else and we thought he was gone.. next thing there’s a tap on Kai’s shoulder and it is Dario asking “did you want a photo?”. Well.. duh! Didn’t have to do it but still made our day. On Friday I spotted Helio Castroneves in the crowd and he stopped for a photo with Kai. On Saturday she returned the favour, spotting Helio a mile away and running after him, I gave chase and I got my own photo with an Indy 500 winner! 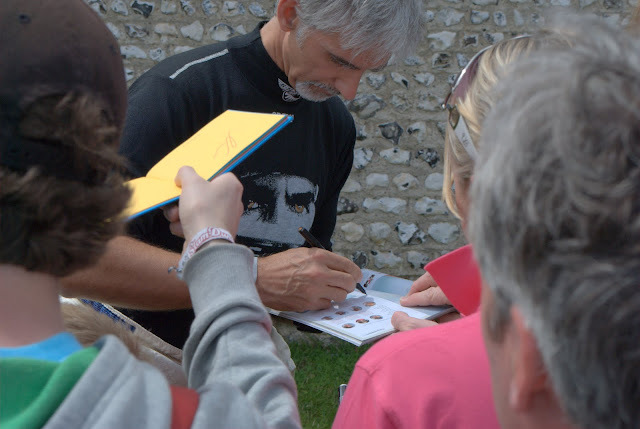 So that was that, I thoroughly recommend attending the Festival of Speed especially with like-minded souls, the more pairs of eyes the better for spotting people or splitting into groups to track them down! It is all about being sure to be in the right place at the right time. Do check out my photo galleries for more, there are some interesting nuggets in there even if I’m not a great photographer and I only have a budget point-and-shoot camera. There are videos in the galleries but as they aren’t easy to distinguish you may prefer to look at them on YouTube. I’ll leave you with these videos. A lot of TV coverage of the Festival is professionally made and as a result is very well-polished, so much so that I always feel it doesn’t get across what it is ACTUALLY LIKE to walk around in the paddock. Well.. it is like this. Enjoy. You just don’t know where to turn next. Famous person there, famous car there, engine suddenly bursts into life in front of you.. Why yes.. that is Adrian Newey about to get into a March Indycar he designed in the 80s… And Bobby Rahal about to get into a 1931 diesel car.. And Dan Wheldon hanging around the Target Chip Ganassi car which genuinely is the one scheduled to be raced by Scott Dixon at Edmonton in a few weeks. Any complaints? Too many people on Saturday, it felt uncomfortably overcapacity in places. Track commentary needed to stop talking about cars waiting at the start and tell us what was in front of us. It was very hot at times, I didn’t drink enough fluids and didn’t realise how much it took it out of me until Sunday when I was at home resting! And my feet are killing me still despite wearing walking shoes! Was it worth it? Oh yes. Absolutely. If you’ve never been, you need to go. Add it to your bucket list. Kai is from the US and had never been to an F1 race or an IndyCar race I think, yet here there were stars and cars from both. In this final instalment of my Goodwood round-up I’m going to cover some of the trackside action as well as some of the ‘names’ I bumped into over the day. I particularly like the video at the end. There are several ways to do Goodwood. The organisers want you to spend a weekend ambling around in a relaxed ‘garden party’ atmosphere. This is very appealing and you can do that if you ‘re only there for a single day as I was but you would miss out on a lot, so I was moving quickly all day darting from place to place and revisiting areas based on the programme of events. Even so, I didn’t make it far up the hill and so missed the dedicated rally section completely. I arrived at the site at about 11am, watched for a while near the entrance before heading to the Cathedral Paddock and the F1 Paddock. I exited the paddock on the far side, going uphill, to see what was there. The answer: not much. A couple of WRC and GT trucks and the McLaren and (deafening) Red Bull Racing merchandise stands, both over-priced as always. I knew the modern F1 cars were not far off running again so they’d be in the paddock collecting area soon, so I headed there. 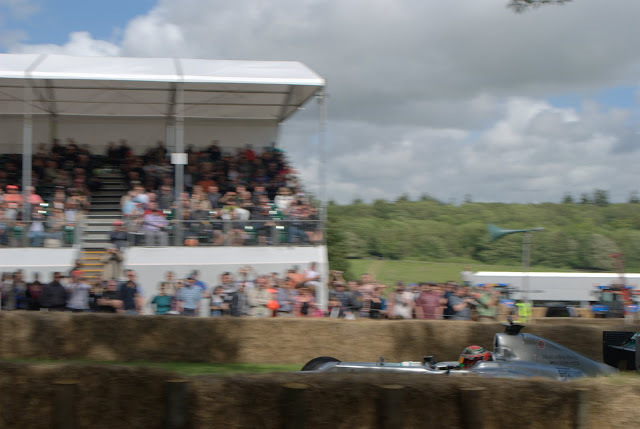 I want to share a few of the videos I recorded during my day at this year’s Goodwood Festival of Speed, before I write up my final instalment (yes late, I know). I spent a bit of time playing around with videos after trying and failing to take photos of moving cars through the small gaps in the crowd. 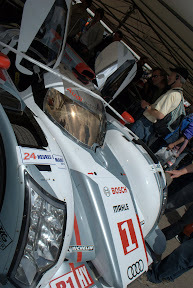 Here are the unedited results – they aren’t really good enough for the write-up posts because some are short and the camerawork is not steady, but equally they really are worth sharing because firstly there are some good car/driver combinations, and more importantly they get across the actual experience of being there. If you are looking with your own eyes it is the same as with the camera, you sometimes only get glimpses as the car passes faster or slower than expected or you don’t know it is there at all. That, and the sights and sounds are fantastic at Goodwood so the more chances to show that off, the better! So I was finishing up my walk around the paddock when a truck drove by with a band on it. I’d then moved to the small sheltered area between the collection area and the pedestrian bridge to watch the F1 cars leave the paddock. It wasn’t quite as good a vantage point as I’d hoped and then I’d got bored of the gaps between cars, but it was great fun to guess what was coming next. A little later I was trackside between the main paddock and the next corner, on the paddock side of the track (drivers’ left). This is a McLaren Can-Am – what a noise. 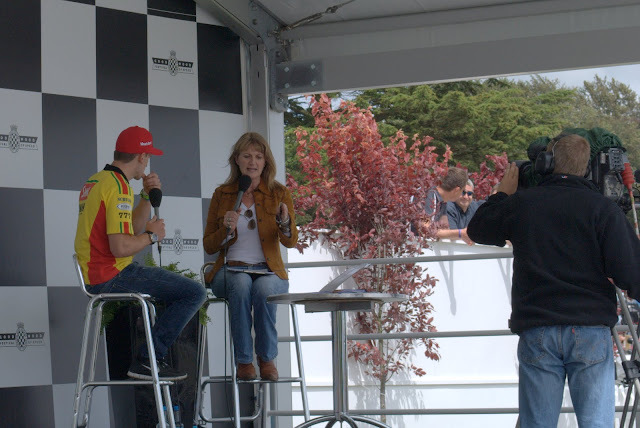 I mentioned the NASCAR presence before, and like many American stars they were keen to put on a show. This is Mike Skinner peforming a mile-long burnout on the entire course! Despite the gentle rarified ‘garden party’ atmosphere of the place, sometimes you do need a bit of agricultural noise and power – and I do love the smell of tyre smoke..
Bruno Senna in his uncle’s iconic McLaren. I was looking forward to this and even for a child who grew up disliking Senna it was a very poignant moment. It was a bit of a shame to see him go so slowly but I’m guessing he was giving a photo op to everyone, which is commendable in itself. Sir Jackie Stewart in Jim Clark’s Indy 500-winning Lotus which has only recently been fully restored. In tribute to his friend, Jackie wore a black helmet similar to that worn by Clark for that famous victory. Karun Chandhok in the Williams FW08 driven by Keke Rosberg in 1982. Sam Bird in the 2010 Williams. I’d moved slightly further up the hill to another little enclosed area here. If you missed them, I posted more videos along with photos from my walk around the Cathedral paddock, the F1 paddock and also one of a 1929 Bugatti. 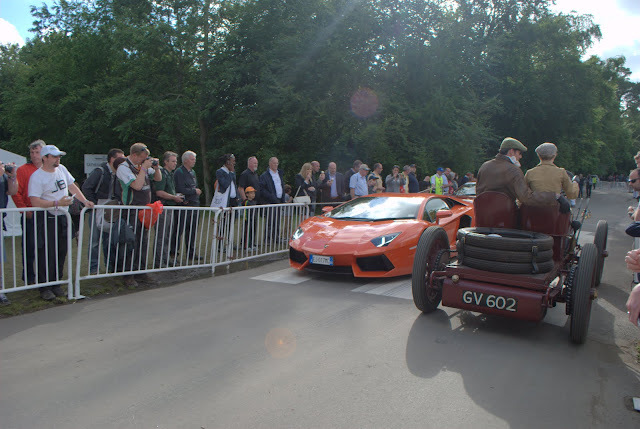 I’ll be concluding this series on Goodwood soon with one final post, featuring a few closing photos and videos from trackside as well as a write-up of my day as a whole. Following my visit to the Cathedral Paddock and a quick stop trackside I made my way to the main paddock area, it is called the Formula 1 Paddock but actually is the home to a little more than that. I’ll recap my trackside visits in my next post, for now let’s take a walk around the Formula 1 Paddock to see what delights it holds. This is a far busier paddock than the other one as it contains F1 cars, plenty of sportscars from Le Mans and elsewhere as well as various racing bikes, and these are all very popular. It means you can’t get a good look at the cars unless you are either very patient or you can push your way through. If you’re approaching from the House (and the other paddock) you’ll first pass the ‘assembly area’ which is where cars and drivers form up before a run, unfortunately it was empty when I first came through so I made my way to the first row of cars. Next to the Audi R8 LMS was the BMW ‘Art Car’ from this year’s Le Mans, and you can see the other sportscars lined up in that row including the CRS Racing Ferrari from the Le Mans Series, at the very end of the row was the 1991 Silk Cut Jaguar XJR14 which is just gorgeous! One of the great things about Goodwood is how you can walk alongside and behind the cars to get a good look at them, the by-product being you get to check out the rear view of the adjacent row such as with this 1954 Mercedes W196 sitting behind the Audis. Just around the corner you find other classic Grand Prix cars including the legendary Maserati 250F, and this BRM and Ferrari 246 Dino. This is a Vanwall and a Brabham. Behind the Vanwall you can see a classic Lotus and the ‘new Lotus’ transporter. There’s a small Indy car presence too, the third shot here shows classic cars from 3 eras, the red car is a Maserati converted from Grand Prix racing. One of the highlights of the entire day was this 1965 Lotus-Ford in which Jim Clark won the Indy 500, I saw it here last year mid-restoration as a static display and they promised to bring it back this year and run it up the hill, which they did all weekend. They cars are exhibited in widely-defined collections, so you have a line of sportscars, a line from Lotus, a line from Williams, a line of pre-war GP cars and so forth. I really enjoy seeing the lineage and the development of a team’s cars over time particularly when they wear the same livery. The Lotus collection including the 72E, 79 and 95T. In the middle photo of the 79 you can see some of the other cars lined up with the Indycar at the end, the car with the gold scheme is the 56B with a turbine engine. Just as with the lower paddock, in the top paddock you can turn a corner just as an engine near to you is fired up. Here is what I believe is the Tyrrell 006, minus engine cover. Ahh the sweet DFV. Sorry it is such a short clip and the camera is being waved around, better than nothing right? A couple of shots of the 1994 Lotus because I’d never seen it before, it is quite a rare car to see in public nowadays. I’ve seen the 1993 Williams here several times but I never pass up an opportunity to take a look at my favourite-looking Formula 1 car of all time. All that remained to be seen in this paddock were the contemporary Formula 1 cars. 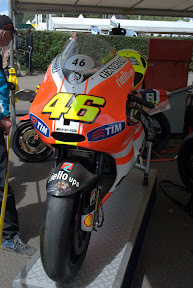 I’m afraid I skipped the motorbikes, I do watch MotoGP but I can’t say I’m a huge fan of bike racing in general and know little of its history. Mercedes GP brought the championship-winning Brawn GP 001 painted in this year’s colours – I understand the PR reasons for doing so but really, a championship winner needs to remain in the original colours.. McLaren brought the MP4/23 from 2008 as well as a 1986 MP4/2C. Williams took Keke Rosberg’s FW08 which Karun Chandhok drove up the hill and what was reported as the 2010 FW32 which Sam Bird drove that day, though usually F1 teams aren’t allowed to run their current cars due to testing restrictions so I’m not sure how true that is. You can see members of HM Armed Forces having a quick tour at Williams. I actually saw Chandhok and Bird while I was snooping around the Williams garage, unfortunately I only got the back of Karun and my shot of Sam didn’t come out well at all. He did come back but I was too shy to say anything to the man or get a photo with him, I’m not very good with famous types when I’m on my own, not a clue what to say! 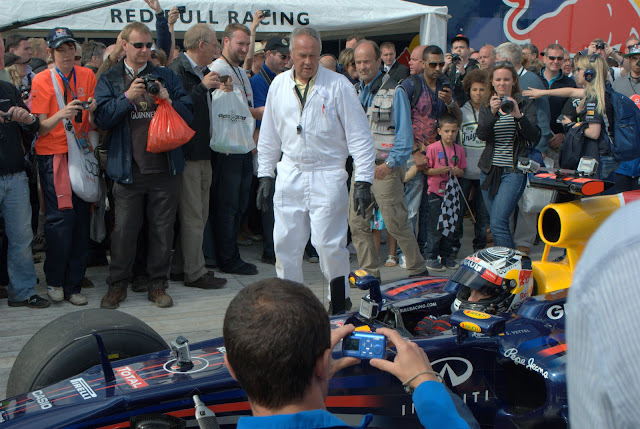 Not sure why that guy is smirking at me..
One last thing in the paddock..
Red Bull RB5 being warmed up with the great juxtaposition of the music before and after! For those who have never heard a Formula 1 car in person, know that the music was fairly loud and the car really genuinely is that much louder. Apologies for two videos, I stopped it when the woman walked in front. That about wraps it up for the content in the main paddock, I’ll be back in a couple of days with a report on another aspect of Goodwood! All images and the YouTube video used in this post were taken by Patrick Wotton. You may use them if you assign the appropriate credit and link to this blog. 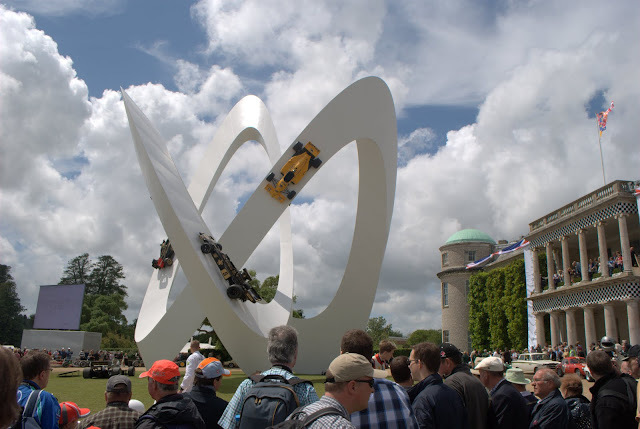 There are two paddocks at the Goodwood Festival of Speed. The main area is called the Formula 1 Paddock and it holds not just modern and classic F1 cars but also Le Mans, DTM, rally and motorbikes, but there isn’t quite enough room so there is an overspill paddock on the other side of Goodwood House called the Cathedral Paddock. It tends to house specialist stuff like early GP cars, touring cars from down the years, NASCAR Cup cars, old sportscars plus anything from any sub-theme chosen – this year was the Panamerica. It is an eclectic mix in a secluded, out of the way location which feels as though it could be easily missed by many visitors and I suspect many either don’t know it is there, or choose to ignore it because the good stuff is in the big paddock. I don’t know if that is true but it is always quieter than the rest of the Festival, and I very nearly missed it thinking there wouldn’t be much to interest me, I told myself off and went anyway. I was immediately glad I did. Where else do you find pre-war Grand Prix cars sitting in a line, opposite a line of Bathurst 1000km racers from the 70s and 80s, and around the corner from a variety of BTCC, NASCAR and Le Mans racers? If your life is F1-only perhaps it won’t interest you but please, if you do like to check out the other stuff do yourself a favour and visit this paddock. I’ve come to really like this paddock and on my next visit I plan to take my time in there.